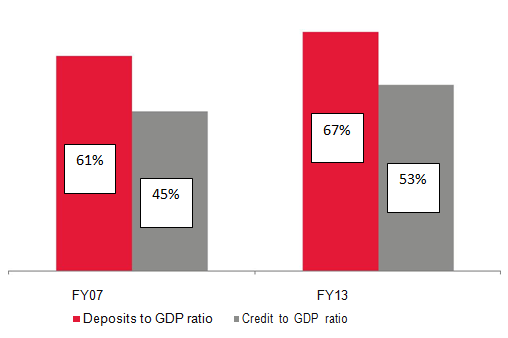 Aggregate deposits of all Scheduled Commercial Banks (SCBs), as a percentage of GDP increased from 61% in FY07 to 67% in FY13, driven by increasing demand from retail customers. Credit to GDP increased from 45% in FY07 to 53% in FY13 indicating the improved lending of SCBs to various industries, which has enhanced trade and economic development. Within the Banking, Financial services and Insurance (BFSI)sector, financial intermediaries such asDSA’s, insurance agents, mutual fund advisors, etc. account for the largest share (65– 70%) of employment. 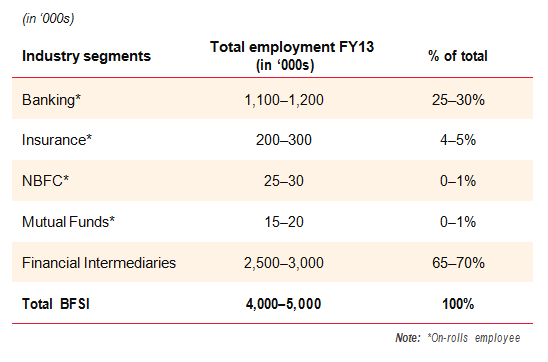 Banking stands second in terms of employment (average share of 28%). The banking sector is projected to create up to 2 million new jobs in the next 5-10 years, driven by issuance of new licenses and efforts to expand financial services into rural areas. Low Banking Penetration: The current all-India CRISIL Inclusix score of 42.8 (on a scale of 100) reflects under-penetration of formal banking facilities in India. Only one in two Indians has a savings account and one in seven has access to bank credit. Financial Inclusion: Approximately 41% of the adult population currently does not hold bank accounts in India, reflecting a large untapped market. With the Government of India (GoI) and the RBI prioritizing financial inclusion and issuing new banking licenses, banks have been encouraged to expand their network through setting up of new rural branches. India’s financial services sector is in the throes of a major transformation. The Indian economy is sending out strong and positive growth signals, which in turn is attracting the attention of highly reputed and high worth global banking and financial institutions. The local economy too has witnessed a proliferation of banking activity and a highly visible surge in the service bandwidth of every bank, whether nationalized, private or co-operative. Adding to the momentum is the RBI,which is seriously driving regulations that will release operating licenses to more private banking players. The all-important financial inclusion initiative of the government to actively promote the habit of banking with its Jan DhanYojana which envisages a “A Bank Account for Every Indian”, is another pointer towards the added pace building up in this sector. The government also aims at creating a massive network of banking correspondents to target rural areas, and installing more ATM branches – one within 15 minutes walking distance of every Indian by January 2016. The Institute of Banking Personnel Selection (IBPS) estimates that Indian banking Industry will recruit 7,50,000 skilled professionals by 2016; more than 4,50,000 fresh graduates will be absorbed by the banking industry by 2016. Another important growth driver is the change in customer service expectations. Traditional bank offerings apart, the customer expects or rather demands, products and services like credit cards, consumer finance, wealth management, life and general insurance, investment banking, mutual funds, pension fund regulation, stock broking services, custodian services, etc. all at his local branch, online or at times even doorstep! No wonder then, that India’s BFSI services sector is poised for a quantum leap forward! And this is where the real opportunity is for every aspiring banker. There never was a better time to start and build a career in this challenging and high growth sector. More account holders’ and more service or product offerings, means more banking operations. This in turn means an added demand for qualified and quality banking and finance professionals. A study has placed the demand to touch anything between 5.5 to 6 lac entry level personnel for the current year itself. With the aid of professional training, technology orientation and a strong focus on selling and communication skills, you too can begin your career as a banker.